Projects for the Foldscope: Part I. Users of the Foldscope are encouraged by the Prakash Lab to share their projects on the dedicated Microcosmos web site. The author's projects shared on that site will be mirrored on Micscape with links to further reading of relevant Micscape articles by contributors where appropriate. As well as exploring the microscopic world with the Foldscope, it also allows studies of the principles of single lens microscopy. The stated magnification of the lens supplied is 140X. For a single lens its magnification is defined as that observed for a subject when viewed at 250 mm from the lens. This is approximately 10 inches and is taken as the closest distance an unaided normal human eye can focus on an object. This is worth trying with two people. View as close as possible (without spectacles if worn) say text on a page while it still remains in focus. Ask a colleague to measure the distance from the eye to the page (take care with rulers near eyes, measure from the side of the head!). The exact distance measured will vary somewhat. This distance is important in microscopy as the image we see using the Foldscope is not a real image, it is called a virtual image. It is this image that the eye sees ca. 250 mm away even though our eyes are actually very close to the lens. 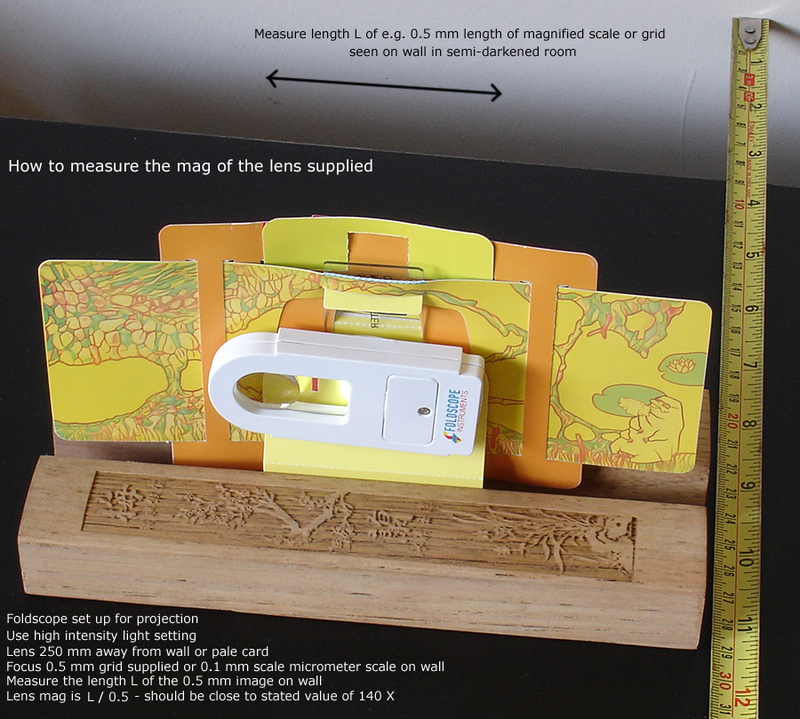 We can measure the mag of the lens ourselves using the type of set up below. Use a semi-darkened room. Support the Foldscope vertically e.g. with wood blocks, books or clamp stand at a measured 250 mm from a wall or vertical pale card. Prepare a slide using the 0.5 mm grid supplied with the Foldscope kit. Alternatively, if own a micrometer slide, use this which typically has finer 0.1 divisions. Focus the scale by eye then mount as shown and refocus a little for sharpest image. To project an image the slight refocus changes the image from a virtual to a real image in order to project it. My result. Five x 0.1 mm units on the wall was 71 mm. This is how much the 0.5 mm field has been magnified. So just divide this measured distance Lm by the actual size La. i.e. Lm / La = 71 / 0.5 = 142 X. That is a close agreement to the stated value of 140 X given we have not used very exact measurements. Owners of the beta trial kit with the higher mag 430 X lens can try the same. This is likely to require the finer scales on a micrometer slide of 0.01 mm. Tip: If the projected scale is too dull to measure, darken the room completely or move the lens closer to the wall at distance D, say 125 mm, where the image will be brighter and Lm will be smaller. The equation below can then be used which corrects for the fact that a measured size on the wall at say 125 mm will be half that measured at 250 mm. The Foldscope: Exploring the construction of a beta trial kit, the lenses and their optical performance. The Foldscope: 'Deluxe Individual Kit' - a first look - describes and illustrates the new design of microscope and comprehensive field kit in the commercial version. This is the version used above. Foldscope project website by the Prakash Lab at Stanford University. James S Cybulski, James Clements, Manu Prakash, 'Foldscope: Origami-Based Paper Microscope', PLOS ONE, vol. 9, issue 6, June 2104. (Open access with online additional supporting figures and videos). Published in the December 2017 edition of Micscape.